With summer upon us and lot's of ticks around this year, discussing tick-bourne diseases seemed appropriate. We typically think of dogs getting ticks but cats can as well. I am going to seperate dogs and cats in my discussion because they get different diseases but they also share some. The Centers for Disease Control have also noticed a spike in the Midwest Regions in the number of tick-bourne related reported illnesses this year in humans and animals. Ticks typically need blood to survive and complete different life cycles. 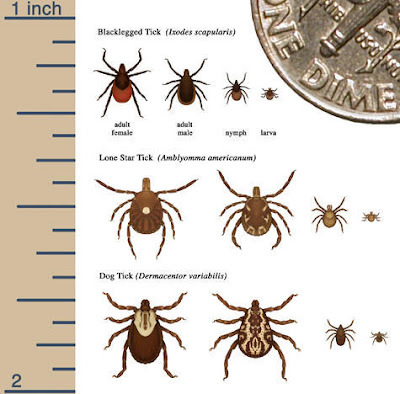 They attach to the pet and on average need close to 48 hours to transmit a disease, if that tick is infected. Not all ticks are infected but they all do need blood to survive. Different types of ticks carry different types of infection. I will be mentioning the diseases we see more often in the Midwest and surrounding areas. This topic is also very near and dear to me because I have a dog whom suffers from Erlichia (tick-bourne disease). He will be affected for it his whole life and it can re-appear at any time. When I rescued him from the Caribbean, he was already positive for the disease. I commonly will get a question about the right and best way to remove a tick and dispose of them. You are going to want to get the head of the tick, which is what is buried in the skin, out. This can be difficult ....a tick digs in using two sets of hooks. Each set looks like a hand with three hooked fingers. The hooks dig in and push into the skin. Then these “hands” bend in unison to perform approximately half-a-dozen breaststrokes that pull skin out of the way so the tick can push in a long stubby part called the hypostome. If you have rubbing alcohol at home, apply alcohol to the tick and it can act like a smothering agent and sometimes they will back out a little. You will still need to pull on it to remove. When in doubt, then bring your dog to the veterinarian for help!!! We can remove it for you. Due to the complexity of each disease, I am not going to get in to the specifics but focus on prevention and appropriate diagnostic testing. If you suspect or have found a tick on your pet then we recommend the 4DX test run by IDEXX laboratories or a similar test (ask your veterinarian). I also recommend that this be a yearly test run because it includes a heartworm test also and is able to pick up tick-bourne diseases before we see any clinical signs or long lasting effects. The other huge benefit from this test is that it can distinguish between exposure, vaccine and active infection. If your pet tests positive for one of the tests, you will be guided on whether to treat or a more specific diagnostic test will be choosen. All of the above tick-borne diseases have similar symptoms. If left undetected and untreated they can cause more serious internal problems. Annual testing allows us to catch things sooner and treat early. The most common and effective treatment for a dog with a tick-borne disease is Doxycycline, which is an oral antibiotic. The treatment for heartworm positive dogs can vary depending on the stage of the infection. Since tick-borne infections can be life threatening especially in cats, prevention is key. If your cat goes outdoors, he or she should be under your direct supervision or within a secure outdoor enclosure. Any cat with outdoor access should be checked for ticks each evening, especially during the warmer months of the year. It’s also a good idea to apply a safe tick repellent or flea and tick collar made specifically for cats. As far as diagnostic testing for cats, there isn't one test that looks for all of their tick-bourne disease issues. In cats we typically do general blood work and then add-on the appropriate test when we have a little better idea which disease it might be. Unfortunately, the outcome for a lot of these diseases in cats is death. So again prevention is so key. If you have an outdoor cat and it is sick, make sure you mention this to the doctor. Bravecto is an oral preventative for dogs and topical preventative for cats which prevents the major ticks that I mentioned earlier and is good for 12 weeks of protection with one dose or application. Good for fleas and ticks. Parastar is a monthly topical preventative which also kills fleas and some ticks in both dogs and cats. Nexgard and Simparica are oral monthly preventatives that kill some ticks and fleas but are only used and safe in dogs. Revolution is another topical medication used in both dogs and cats. Unfortunately, not the best for tick coverage. Seresto collars are good in the dog and cat for up to 8 months and kill ticks and fleas. There are other topical medications for cats and dogs but the efficacy is questionable. Nourish your dog with VitaLife’s chicken jerky treats which are made with pure chicken. This one-ingredient treat is easily digestible and rich in nutrients. Because of its oven-baked goodness, VitaLife jerky maintains an aroma that dogs go crazy for.